Hmmmm... I never really thought about the transistor as a crystal amplifier (a la the 'crystal detector'), but in fact it was fabricated from a crystal of germanium with two 'cat whisker' wires pressing on its surface. Before the transistor was the simple rectifier made of a crystal of selenium or even carborundum with a point contact. Those were used for turning AC into DC and for detecting radio wave modulation envelopes. 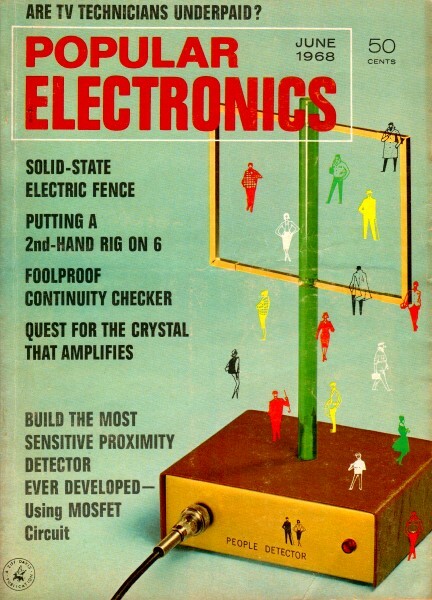 For a really good synopsis of the early development path of semiconductors, read this story from a 1968 edition of Popular Electronics that commemorated the 20th anniversary of Bardeen, Shockley, and Brattain announcing their transistor. Having been written much closer to the days of discovery, the story has not been filtered through as many writers' points of view, and contains some information I'll bet you have never read before. E.g., did you know that semiconductor dopants were originally referred to as adulterants? Did you know that Shockley's early research was on field effect devices and, if successful, would had made FETs the first forms of transistors rather than bipolar junction types? Did you know that the name 'transistor' (trans-resistor) was coined after the vacuum tube's amplification action called 'transconductance?' Read on for more. We call it a transistor - but 20 years ago it was and ugly duckling. The birth of the transistor was not something that happened overnight. It marked the culmination of many years of dreaming and searching, not only by scientists, but by a couple of generations of quixotic tinkerers as well, seeking to extract from a tiny chunk of the mineral galena some magical energy that might eliminate the need for power-consuming vacuum tubes in radio receivers. Some of these experimenters actually produced crystal sets that could operate loudspeakers-at low volumes - perpetually and without need for external power. Sir Oliver Lodge (1851-1940) made many important contributions to wireless transmission and reception, which led to UHF transmission techniques. These devotees of the galena mystique thrived for some thirty years on trial-and-error and wishful thinking. During this time, they were joined by a handful of scientists who worked unnoticed behind the scenes, taking a more methodical approach to essentially the same goal. The scientists were mostly engineers, metallurgists, and physicists who had been recruited by industry - some of them from university faculties - to help seek new ways to improve the efficiency of electric power and communications devices. Finally, in the late 1940's, the quest for the crystal that amplifies ended in triumph for a trio of distinguished industrial scientists. The year 1968 marks the 20th anniversary of what has since become recognized as one of the most momentous events in the annals of electrical science. The primordial spark to which this quest can be traced occurred around the turn of the century when the need for a practical rectifying device arose almost simultaneously in two budding young industries: electric power, and radio. In electric power, the advocates of alternating current had won their battle against the d.c. interests and had begun to distribute a.c. power on a wide scale. This meant that some kind of practical converter, other than a motor-generator, would be needed to permit the operation of d.c. apparatus - battery chargers, electroplating equipment, telephonic devices, etc. - on commercial a.c. power. The rectifying properties of selenium had been known for nearly a century, but it wasn't until 1924 that semiconductor rectifiers became commercially available. By the early thirties, copper-oxide rectifiers had come into wide use as converters. Selenium, which had at first proved unsatisfactory for use in power conversion, was gradually improved and eventually surpassed copper-oxide in popularity. The names Mott and Schottky are two that stand out in connection with the early evolution of rectifier theory. Working independently of one another - Sir Nevill Mott in England and W. Schottky in Germany - both men concluded that rectification took place in a thin electrical barrier that formed at the junction of a metal contact and a semiconductor. Schottky called this surface barrier an "inversion region" within the thickness of which a change of conductivity took place. The theory was to play a prominent role in the reasoning that later led to the invention of the transistor. Radio's need was for a practical rectifying detector of received signals, and it arose with the advent of voice transmission. In its embryonic stage (1894 to about 1906), a radio receiver had at its heart a "coherer," in which metal filings clung together on exposure to electromagnetic disturbances, thereby varying the current in a local battery circuit. The disturbances were set up by a spark transmitter being turned on and off with a telegraph key. 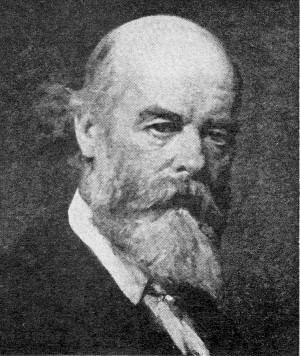 First used by England's Sir Oliver Lodge in 1894, the coherer* had been steadily improved in design and had reached a fairly high level of refinement by 1900 when Professor Reginald Fessenden of the University of Pittsburgh succeeded in transmitting voice on a continuous wave. 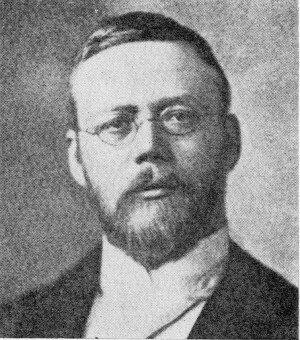 Professor Reginald Aubrey Fessenden (1866-1932). a pioneer in wireless communication, was the first man to voice-modulate a continuous-wave carrier. Radio suddenly found itself faced with much the same situation that had created the need for rectifiers in the electrical industry. The transmitted radio wave became a "carrier," its cargo a modulation envelope that was electrically self-cancelling until the alternating current could be made to flow in one direction only. Radio detection thus became a matter of rectification. Fessenden's first detector was an electrolytic device of his own design. It was highly sensitive, but also critical and unreliable. The first practical crystal detectors appeared in 1906. The one invented by G. W. Pickard used silicon and featured a "catwhisker" (fine wire) contacting arrangement similar to that suggested by a German experimenter named Braun some 30 years earlier. Another type, invented by H. H. Dunwoody, an executive of the De Forest Wireless Company, used a small chunk of carborundum clamped between two electrodes. The crystal detector reigned supreme until the early twenties when the vacuum tube began to make inroads. Silicon had proved to be the most stable crystal, but galena (lead sulphide) was the most sensitive and therefore the most popular. As in everything, however, it takes power to beget power; thus, there were the inevitable "A" and "B" supplies wherever vacuum tubes were used. What's more, some of the power had to be wasted in heating the tube filament - an unfortunate requisite that was to impose serious restrictions on the tube's useful life and on the design of the tube-using equipment. Crystal detectors needed no external power supply; they were simple and compact, and there was no heat problem. But they couldn't amplify - at least not until a group of scientists at a major industrial research laboratory had undertaken an intensive investigation into the mysteries of solid-state semiconductors. In 1934, the Bell Telephone Laboratories began to develop fixed semiconductor diodes for use in microwave experiments. The earlier ones were silicon and germanium point-contact devices resembling the "fixed" detectors that had been used in some crystal broadcast receivers. ("Point-contact" is a sophisticated term for the old familiar catwhisker.) The more advanced junction diodes were developed during and immediately following World War II. Walter H. Brattain had come to Bell Labs shortly after having received his Ph.D from the University of Minnesota. His involvement during the thirties in the study of electrical conductivity in semiconducting materials eventually brought him in contact with William Shockley, a brilliant young Ph.D who joined the staff in 1936 and soon began to form some ideas of his own on the potentials of semiconductors. In that same year (1936), Dr. Mervyn Kelly was appointed Director of Research at Bell Labs, and one of his first acts was to assemble a team of physicists to formally explore the behavior of electrons in solids. Brattain and Shockley were among those selected. Since the late thirties, Shockley had been entertaining the notion that a semiconductor ought somehow to be able to amplify an electric current. His attempts to achieve "valve action" in a copper-oxide device were interrupted by World War II. Immediately following the war, he constructed a special device based on a scheme he had worked out on paper. But, as is so often the case, what appeared workable on paper did not work in actuality. Ironically, the device that had failed was the forerunner of the field-effect transistor (FET), which was to re-emerge many years later to be heralded as one of the more important advances in solid-state technology. Had Shockley's experiment been successful - if more had been known about the characteristics of semiconductor materials - the development of solid-state devices might have taken a completely different course. It was about the time of Shockley's "field-effect" experiment that the Bell Labs team was enhanced by the addition of a new member. He was John Bardeen, a 37-year-old theoretical physicist and former university professor whom Shockley had personally recruited. During the preceding decade, Bardeen had done extensive work in the field of electroconductivity in solids. The fact that Shockley's experiment had not yielded the expected result interested Bardeen and set him working on a theory to explain why. Taking his cue from Mott and Schottky, Bardeen theorized that surplus electrons gathered at the surface of a semiconductor and became immobilized so that, in effect, they acted as a sort of barrier to externally applied currents. To test his "surface states" theory, he and Brattain performed a series of interesting experiments. At first they used a liquid electrolytic as a current-carrying medium between one side of a power source and the surface of a piece of semiconducting silicon. They found that by passing a current through the electrolyte, the surface charge on the silicon could be altered. 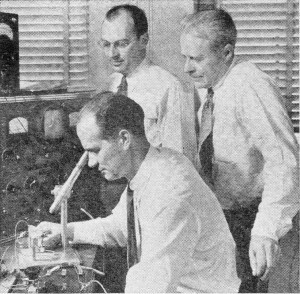 William Shockley, John Bardeen, and Walter H. Brattain, co-discoverers of the transistor, received the 1956 Nobel Physics Award for their invention. This led Brattain to suggest a slightly modified approach. Germanium was substituted for silicon, and a thin layer of gold for the electrolyte as the special contacting interface. Two currents were made to flow in opposite directions through the germanium, one between the gold contact and a solid connection at the base of the material, and the other between the base connection and a cat-whisker contacting the surface - near the gold contact. As had by now been anticipated, varying the one current produced corresponding variations, but of greater magnitude, in the other. Amplification had been achieved! The technical explanation for the phenomenon was highly complex and dealt with such things as atomic valences, "holes," "donors," and "defect conductivity." Stated simply, what had happened was that the tiniest plus charge at one of the two contact points on the semiconductor surface had drawn off enough of the material's surplus electrons to create "holes," which, in turn, were attracted to the adjacent negative point and therefore functioned as vehicles by which the lesser current could influence the greater one. In essence, then, the semiconductor had become a variable resistance, enabling control of current flow in one circuit by varying the current in another. By the close of 1947, experiments had proved the new device capable of amplifying audio frequency signals. Bardeen and Brattain quietly announced their discovery via a letter to the editor of "The Physical Review," published in the July 15, 1948, issue. The first transistors produced in quantity in the laboratory contained a tiny chunk of slightly impure germanium on which two "catwhiskers" converged, contacting the surface at points less than a hair's breadth apart. William Shockley, meanwhile, continued to pursue his own ideas on how best to make a semiconductor amplify. His quest led to the invention, later in 1948, of the junction transistor in which transistor action was achieved by the sandwiching together of p-type (electron deficiency) and n-type (electron surplus) semiconductors. Shockley's design, although at first more difficult to fabricate, proved more predictable in its properties and less fragile than its "point contact" predecessor, and was therefore soon to supersede it. The junction transistor was introduced early in 1951. A major obstacle to mass production was the requirement that semiconductor materials contain carefully controlled degrees of impurities to insure the proper electrical imbalance. This meant starting with a nearly pure substance and then adding adulterants (such as arsenic or gallium) by a carefully controlled doping process. The introduction of zone refining in 1955 was the first big breakthrough in high volume production of the basic materials. In recognition of the magnitude of the revolution they had kindled, the transistor's trio of inventors - Shockley, Brattain, and Bardeen - were awarded the 1956 Nobel Prize in Physics. But, during the middle fifties, the widely acclaimed little device still suffered a number of serious shortcomings. For one thing, it was critically temperature-sensitive and therefore unable to handle power beyond a fraction of a watt. What's more, it was noisy and unstable, had ridiculously low input impedance, and was a sluggish device whose switching speed and frequency response left much to be desired. These shortcomings, however, were gradually overcome as new manufacturing processes were introduced and semiconductor materials with improved electrical characteristics were developed. By the late fifties, the reliability of the device had already begun to exceed that of vacuum tubes. Further Improvements. New developments followed in rapid succession, and with them came a whole new electronics vocabulary: p-type, n-type, bipolar, diffused junction, epitaxial growth. The grown junction gave way to the alloy junction, which, along with the introduction of the diffusion process, resulted in improved frequency response and switching speeds. It was now feasible to use transistors in computers - a marriage which, in turn, was to enhance the evolution of still faster and more reliable semiconductor devices. The diffusion process also broke the transistor's power-handling and temperature barriers by facilitating the use of silicon in place of germanium. Mesa, planar, and epitaxial devices emerged as some of the more prominent offshoots of the diffusion technique. The field-effect transistor, which had continued to lie dormant in the laboratories, seemed to hold the key to some of the improvements still needed - higher input impedance, for example, and lower levels of noise and distortion. Of all semiconductor devices, it came closest to a vacuum tube in characteristics. But the electrical surface properties of the semiconductor material used in its fabrication were critical, and it was not until recently that FET's finally became competitive with other semiconductors. Similarly, the unijunction transistor, with its single p-n junction, was originally developed in the early fifties, but is just now beginning to emerge as one of the less expensive, more stable, and temperature-resistant devices. The late fifties saw the introduction of miniature circuit modules, silicon-controlled rectifiers (SCR's), and Esaki's remarkable tunnel diode, with which amplification was possible without the traditional "third element." SCR's shrunk the gap between tube and semiconductor capabilities by providing a highly efficient solid-state replacement for thryatrons and mercury-arc rectifier tubes in power control equipment. The pace of development of new transistor types has been absolutely staggering. The list now numbers in the thousands, and it continues to grow as the mighty midget celebrates its 20th birthday. Apart from its having reshaped an entire industry and opened many new doors, perhaps the most fascinating offshoot of the whole solid-state technology to date has been the subordinate art of micro-electronics. Already in the making are integrated circuits so minute that an entire amplifier could hide behind a single transistor. Solid-state technology has been growing and changing at such a dizzying pace that it is difficult to predict what lies ahead even in the next year or so. Perhaps at this very moment, somewhere in the world, a small but persistent group of experimenters is exploring a radically new concept that may someday render the present technology obsolete. *For more details, see article entitled "The 'Coherer' " which appeared in the May, 1961, issue of Popular Electronics. Newsreel from 1956, showing William Shockley, Walter Brattain and John Bardeen receiving the Nobel Prize for the transistor.